It’s 7 days until Christmas and I feel like I’m only just starting to get into the festive spirit. It’s been a very busy fall and winter and now that Got Craft (an awesome Vancouver craft fair) is over, I feel I can start feeling festive. And a good thing too, because this Friday is our building’s Crawl. The Crawl means that we wander into everyone’s apartment who wants to participate and eat snacks and drink cocktails or mulled wine. It’s a fun way to spend time with our neighbours and a drink or two always makes everyone a bit more neighbourly. Last year I made everyone a Last Word cocktail and we snacked on homemade cheese straws. 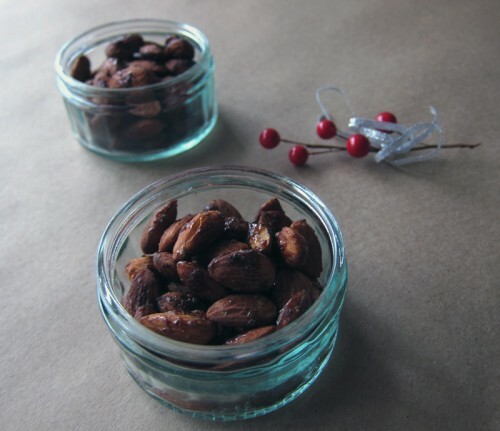 This year, I still haven’t got a clue what cocktail to make (but I’ll gladly take suggestions in the comments), but I did make these sweet and spicy almonds last night. 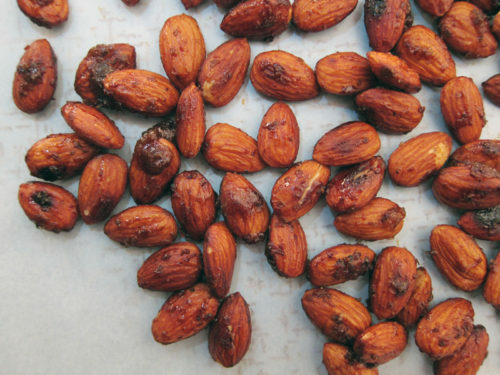 Unlike most spiced nut recipes, these don’t require a spin in the oven. It’s even easier than that….they get toasted and spiced right on the stove in a cast iron skillet. The only trick is making sure you don’t burn the sugar, so please watch them carefully and stir often (make that constantly during the last few minutes). The sugar not only melts, but it gets a little molten and clumpy. You can see clumps of melted sugar hanging onto some of the almonds…but that turned out to be the very best thing! Super tasty, sweet and crunchy. As soon as the almonds are out of the pan, they get tossed with salt, cumin and aleppo pepper. Sweet and savoury? The perfect mix! The original recipe is from Martha Stewart and required double the sugar and then some. I cut the sugar and didn’t feel it needed more and I also used aleppo pepper instead of red pepper flakes for a fruity less-spicy heat. I did have doubts about using cumin along with sugar but it was perfect! I tweaked the recipe further by using some applewood smoked salt that I had picked up at Got Craft from locals The Salt Dispensary. If you can find smoked salt, use it. If not, you’ll still be in possession of a very happy snack. Pack in mason jars and give as a gift or serve it at your holiday get-together. In a large heavy skillet, heat oil over medium high heat and stir in almonds until well coated in oil. Add sugar and stir until the sugar melts and caramelizes. The original recipe says 4 minutes – for me it took twice that long, but watch out that the nuts don’t burn, so stir quickly! Pour nuts into a large bowl and toss well with the salt, cumin and pepper. 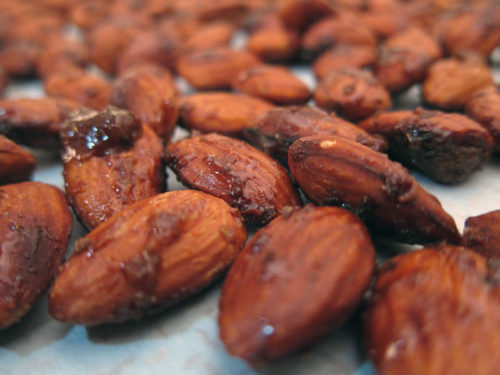 Pour almonds onto a baking sheet or a piece of parchment and spread out onto a single layer to cool, breaking up clusters with a spatula or wooden spoon. When cool, store in an airtight container. 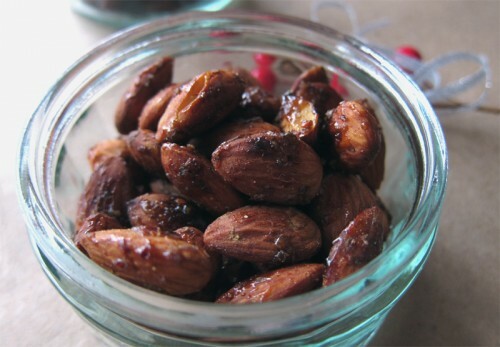 These nuts look amazing (just like everything else on your site!) I did this rosemary gin drink at a Christmas party last year and it was a hit http://www.sassyradish.com/2009/12/rosemary-gin-fizz/ and am eyeing up a version like this http://www.101cookbooks.com/archives/winter-punch-recipe.html (I’m thinking a few blood oranges maybe?) For this year..citrus, rosemary, and gin always a winning combo! Yum. I’ve tossed sweet and smoky nuts with cumin seeds before but the aleppo pepper is an awesome addition to the mix. Kim, thank you for the cocktail tips! Citrus is the way to go and I love the addition of rosemary 🙂 I’ll come up with something! Thank you. Joanne, yes, these were super tasty. Perfect for holiday snacking. 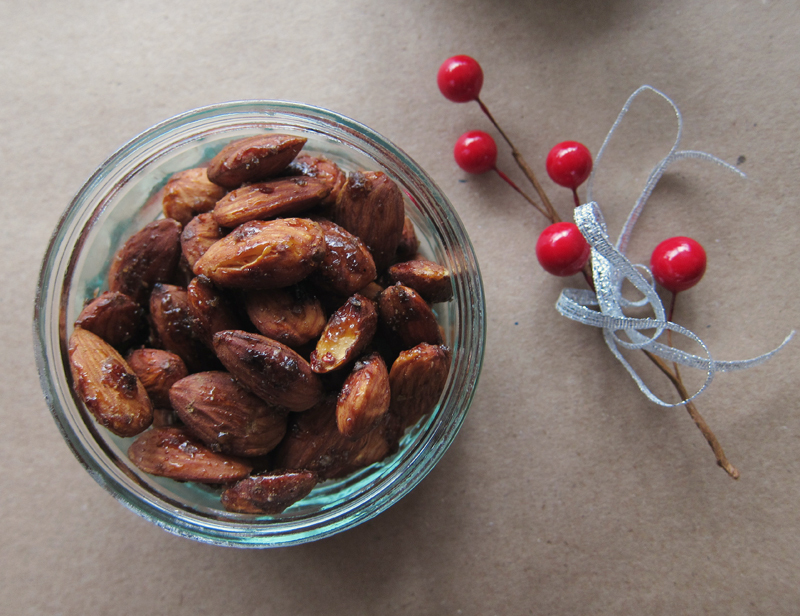 Seriously, how can you go wrong with spiced almonds and nuts, especially during the holidays! These look super yum, and I’m stashing this recipe away for my upcoming post-holiday family visit back in the States in a couple of weeks! 😀 Merry Christmas!